I am really trying to beef up my Area, Surface Area and Volume unit for Geometry this year. It gets the job done regents-exam-wise, but it is so dissatisfying and I feel it could be so much better. Overall it basically boils down to plugging things into formula-sheet-provided formulas, and isolating variables in formula-sheet-provided formulas. There are some good things in there... we find composite areas and perimeters using aerial and other images, for example. Finding the areas of regular polygons is a good application of right triangle trig. There is an investigation of how areas change when dimensions change, which is serviceable but I suspect kids don't really see the big picture. We "do" volumes and surface areas of prisms, pyramids, cylinders, cones, and spheres. My students tend to do very well on questions from this unit on the Regents exam, and I don't want to mess that up, but in this case I don't believe that the exam is valid for measuring understanding. how changing a 2D or 3D figure's dimensions affects its area or volume. for example, I think they understand that if you order a pizza that has twice the diameter, you get way more than double the amount of pizza. But I don't think that intuition has any ties to math class. isolate a variable in a formula. for example, solve S = lw + wh + lh for w.
I have a bunch of great resources and problems and tasks that I have collected in my Evernote over the past few years that could potentially work very nicely here. 1. Design a new label for a given tennis ball canister, oatmeal canister, or soda can. (a) Create a prototype label so that it covers the entire lateral surface of the canister with little to no overlapping paper. (b) Congratulations! The company chose your design and wants to produce 100,000 labels. Calculate how much material (paper, aluminum, whatever) you will need to order. 2. This game at NLVM is quite nice for challenging your intuition about how volumes are related to dimensions. 3. This video features people with charming accents complaining about how the volume of their chocolate bar decreased even though it appears that the surface area stayed the same or possibly increased. I've shown this in the past and found that students are unable to articulate what these people are upset about using the word "volume" (much less intelligently discuss surface area.) The word "volume" from math class is not connected in their brains to "how much stuff inside." 4. Starting with a piece of copier paper, roll it into a cylinder both the long way and the short way. Will it contain the same amount either way? If not, which way holds more? Mathematically justify your response. 5. Starting with a sheet of copier paper, cut four congruent squares out of the corners and fold up the sides to make a box. Who can make the box that holds the most? Kristen Fouss did something like this but in pre-calculus. Geometry probably doesn't need to get into deriving and optimizing a polynomial equation. 6. Starting with a sheet of copier paper, design, cut out, and assemble a right pyramid with a square base. First pass: any pyramid will do. Second pass: make the area of the square exactly ___. Third pass: make the overall height of the pyramid a specified length. Present your best-looking pyramid, including the area of its base, its overall height, its lateral surface area, its total surface area, and its volume. 8. The car talk fuel-tank problem. 10. Derive the formula for the volume of a sphere without calculus. From Exeter Book 3. Would pose quite a challenge for my students. They would not be able to do it on their own. In fact, as it is written, it would completely mystify them. What I am struggling with and probably will be for the next week or so is, how do I take any of these things and fit them into a logical, coherent unit of study of surface area and volume? NY/my district/my school does not provide us with a curriculum. We have : a list of standards, a collection of previous exams, a pacing calendar, and a kind-of crappy textbook, which are all useful in their own limited ways, but none of them tells you what to do in class. I have lessons already written that get it done, so there is no incentive to bother, other than it bothers me when I feel I could be doing a better job. Part of the dilemma is, I feel that any of this would have to be added to what I already do, not replace it. I still need them to be able to, for example, identify that the bases of a prism are the parallel sides, even if they are not on the top and the bottom. And I'm already about two weeks behind in this course. How do you take a compelling resource and turn it into an effective lesson? I heard of a lovely activity for pseudo-discovering the Intermediate Value Theorem at a recent compulsory workshop for the calculus course I teach. It has everything i like in a thing. I do not have a record of the name of the teacher who presented it (and even if I did, I don't know if he wants to be famous on the Internet) so if you are he, please email me if you want credit. The intermediate value theorem states: If a function y = f(x) is continuous on a closed interval [a,b], then f(x) takes on every value between f(a) and f(b). 1) State the hypothesis of the IVT. 2) State the conclusion of the IVT. 3) In the following, be sure to use the endpoints (a, f(a)) and (b, f(b)). A. Sketch a diagram where both the hypothesis and the conclusion hold true. B. Sketch a diagram where the hypothesis is false, but the conclusion is true. C. Sketch a diagram where the hypothesis and the conclusion are false. D. Sketch a diagram where the hypothesis is true, but the conclusion is false. 4) Which one is impossible to do? Explain why. 5) Compare your diagrams with a partner. How are they similar? Different? If they are different, are they both valid? 6) Is any real number exactly 1 less than its cube? A. Create a function whose roots satisfy the equation. B. Find f(1) and f(2). How do you know there is a point (c, 0)? What do you know about c? 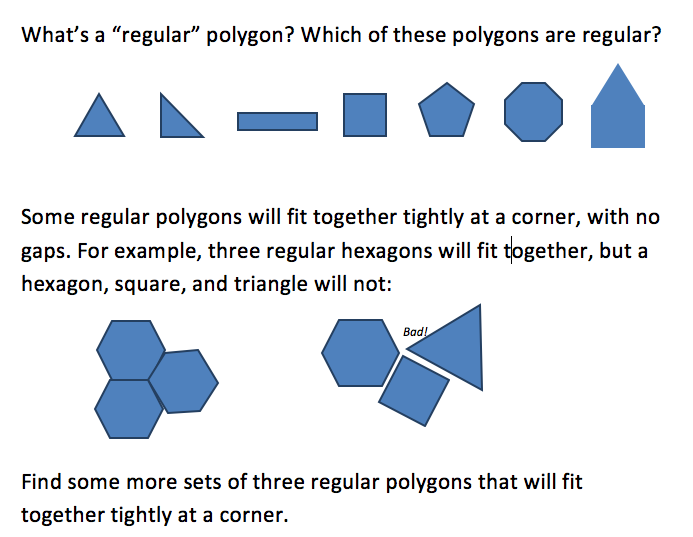 I did not include that first question when I did this in class, and many students stumbled over restricting their search to regular polygons. So I added it after the fact for next time I give this problem. There are lots of these triplets to find, so all the kids met with some success pretty quickly. It is also a little like finding a pearl in an oyster, so they were rewarded and motivated to keep looking. Regular polygons are hard to draw, so with a little reminding and prodding, they started to find the degree measure of one angle in a regular pentagon, hexagon, octagon, etc (the whole, covert point of the activity, anyway! Yay!) I had them add their finds to a whiteboard everyone could see as they were discovered. They also wanted to verify by using the Smartboard to render regular polygons perfectly, and fit them together like puzzle pieces, which I was happy to allow them to do. This was actually a pretty great class - some kids conjecturing likely candidates, some kids armed with calculators cranking out angle measures, some kids organizing all their finds, some kids going up to the smartboard in groups of two or three for visual/spatial verification. And when I assessed them the next day, no one had any trouble understanding the question or coming up with correct angle measures. This problem is a keeper. "What is 1 Radian?" Try it. Dare ya. They'll do a little better with: "What is 1 Degree?" I made some final tweaks to Completing the Square in Algebra 2, and I find it just amazing the difference between this year and previous years, in that so much more often now, I just know what to do. It doesn't feel like I changed all that much, but the kids just get it. I don't think it's a difference in delivery or anything. Here are the important bits. Tee it up: why would we want to do this? It saves us time. Look for patterns. The kids fill out this whole table all on their own. I don't say a thing. I convince them to try and focus by telling them that if they really get how this table works, their lives will be a million times easier for the next six months. It's an exaggeration but you need them to engage here. The bottom three rows were new this year. Hardly any students needed an assist with the * rows. I was surprised. The important part - the mathematics - was the ** row. Again I was surprised that they mostly worked this out on their own. There were some kids, I had to point at numbers, and say "Look at the 10, the 25, and the 5. Look at the 14, the 49, and the 7. How are those related? How can you write that relationship but use b?" And that is basically that. We practice a bunch of easy ones. The next day, we come back and practice a bunch of really hard ones. Here are the smartboard files: Day 1, Day 2. I just find it stunning that you can plan out a lesson 95% correctly and it will miss most of your kids. And you can change one little thing - add three rows to a table - and now all the kids basically get completing the square, think it's easy, prefer it to other methods of solving quadratics, and tell you why they don't get why this is such a big deal. I feel a little like I have super powers.